Although its origins are not so blurred, we do know its use since the beginning of the pilgrimages to the holy city: distinguish the walkers who had completed their pilgrimage on the Camino de Santiago. Traditionally, all pilgrims who had arrived in Santiago de Compostela were given a document of accreditation and were granted a scallop shell to place on their hats or capes. Carrying the scallop shell was considered a form of tribute to the Apostle, as already indicated in the Calixtino Codex texts. In this way, initially the pilgrim shell allowed to distinguish the pilgrims who returned home, not those who had not yet reached the holy city (remember that traditionally the pilgrimage consisted of a round trip home). Despite its initial use, the popularization of the scallop shell has made the pilgrims end up carrying it indistinctly whether they have already visited Santiago de Compostela or not (there are few pilgrims today who undertake their journey back from Santiago walking). 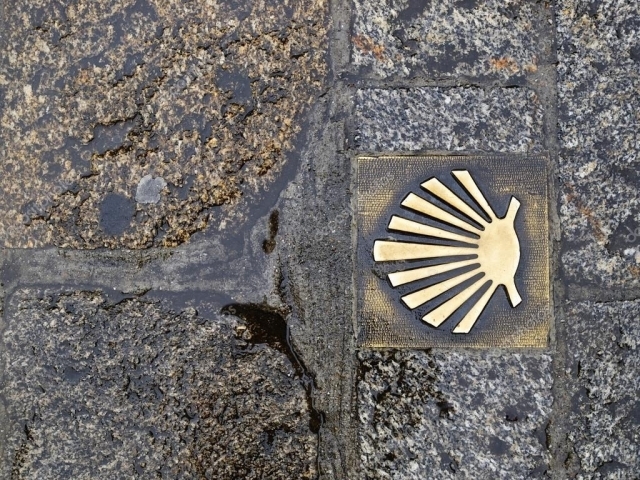 Over the years, the pilgrim's shell has gone from being a pilgrim's emblem to becoming a symbol of the Camino de Santiago. 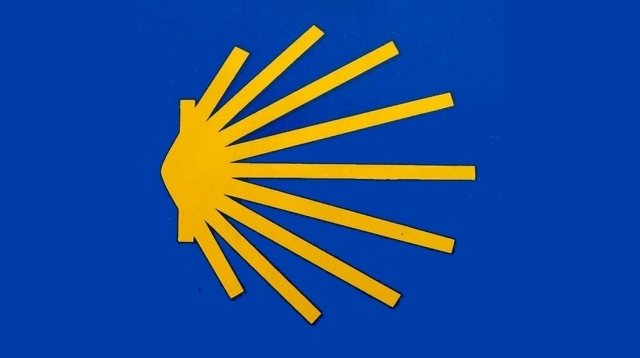 In fact, the scallop shell is one of the symbols officially used by Xacobeo for the signs of the Camino de Santiago that you will see in hundreds of cairns spread over all routes recognized as official, printed in yellow and under a blue background. Despite not knowing for sure the origin of this pilgrim symbol, we do have news of numerous theories that revolve around how this object became part of the iconography of the Camino de Santiago. Some think that the association of the scallop shell with the pilgrimage to Santiago de Compostela is related to its use by pilgrims to drink water in rivers and streams, due to the ease of always carrying an envelope. Others affirm that its use came from the hand of the establishment of merchants around the Cathedral, taking advantage of the peak of the pilgrimages in the Middle Ages. These merchants would have popularized the sale of scallop shells among the pilgrims; Something like a memory to take with them back home. On the other hand, according to popular tradition, the adoption of the pilgrim shell could be related to the return of the disciples of Santiago el Mayor to the Peninsula by boat to bury the remains of his master. On his arrival on the Galician coast, the disciples of Santiago would have seen the celebration of a wedding in which a particular game between riders was taking place. The challenge consisted of throwing a kind of spear into the air while the carrier rode on horseback, with the aim of taking it before it touched ground. When the boyfriend's turn came, the young man's spear would have gone as far as the sea, being chased by the rider, who would unknowingly have runaway his horse, sinking both into the water. Before the amazement of all, rider and horse would appear seconds later safe and sound next to the boat of the pilgrims; Then, as the young man went to greet the disciples of the Apostle, he realized that his body was covered with scallop shells. The fact of their salvation and their subsequent conversion to Christianity would have been classified as a miracle on the part of the disciples, who after the wedding would follow their way by sea to the tomb of the Apostle. To commemorate the miracle, it is said that it was established that every pilgrim who made the Camino de Santiago should carry a scallop shell with him.